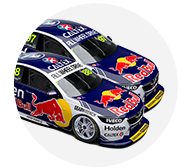 Jamie Whincup and Paul Dumbrell’s Red Bull Racing Australia Commodore will start from ARMOR ALL Pole Position for the third consecutive year at the Wilson Security Sandown 500. 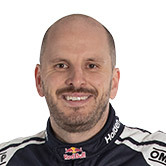 Dumbrell made the critical move in the co-drivers’ qualifying race, taking P1 from the Supercheap Auto Falcon, and then Whincup made it stick with a stunning start, building a 1.2807sec lead over Garth Tander. But a win from pole position is rare, with Whincup/Dumbrell one of just two pairings that have won the Sandown 500 from pole position in the last 29 races – they were in 2014, as well as Craig Lowndes/Greg Murphy in 1996. Tander/Warren Luff will start alongside on the front row, with Volvo locking out the second row, with Scott McLaughlin/David Wall and James Moffat/James Golding starting third and fourth. The primary drivers’ race was only marginally tamer than the co-drivers 60kms. Mostert slid back through the pack after a slow start, and there was action in the pack with Cameron Waters flying off track, suffering a puncture and getting bogged in the dirt, triggering a safety car. There was a battle to finish top five with Fabian Coulthard, Will Davison and Shane van Gisbergen pushing hard. Contact between the two Kiwis saw van Gisbergen slow to redress and allow Coulthard back through after he was pushed off-track. Davison copped a hit from the DJR Team Penske car after the rejoin, but said it was just “one of those tricky ones”. Coulthard, on the other hand, wouldn’t speak to the TV cameras. 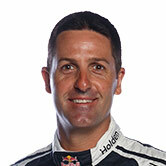 Whincup was pleased to lock in pole position but sees the Holden Racing Team as a big threat tomorrow. “The car was good got pushed pretty hard there by HRT boys, they’re going to be hard to beat tomorrow but starting from the best spot,” Whincup said. Tander seemed amused at the chaos behind – he and Luff are defending the Pirtek Enduro Cup through the long-distance races. “Looks like there was plenty going on, up for the front for Jamie, Scotty and I it was pretty boring,” he said. Craig Lowndes finished 12th after his co-driver Steven Richards was involved in an incident, and Mark Winterbottom was 22nd after Dean Canto’s drive through penalty. The drivers have a final 20-minute warm up tomorrow morning before the 500km dash.